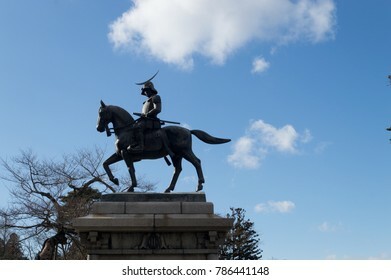 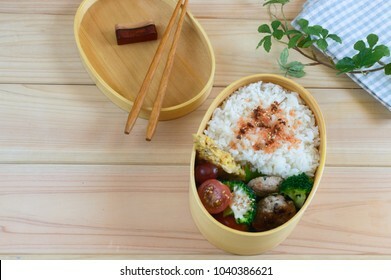 1,212 stock photos, vectors, and illustrations are available royalty-free. 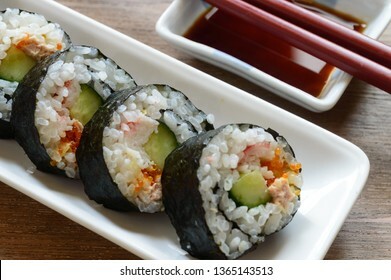 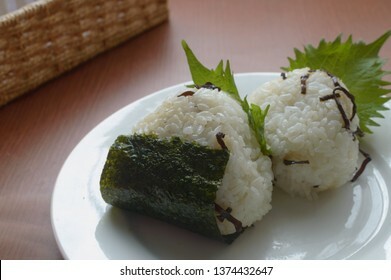 O-nigiri , also known as o-musubi, nigirimeshi , rice ball, is a Japanese food made from white rice formed into triangular or cylindrical shapes and often wrapped with seaweed. 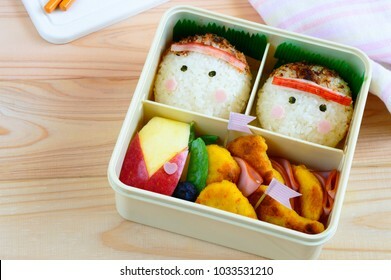 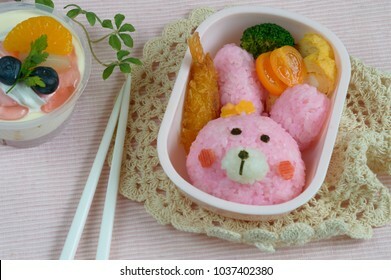 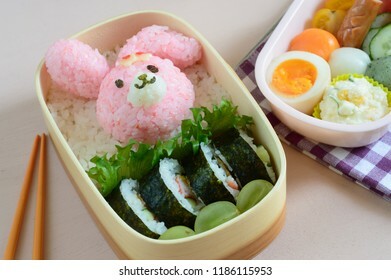 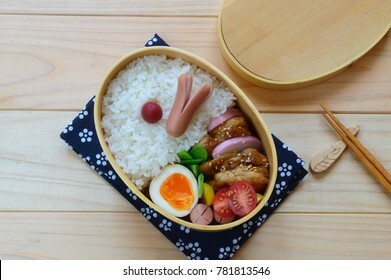 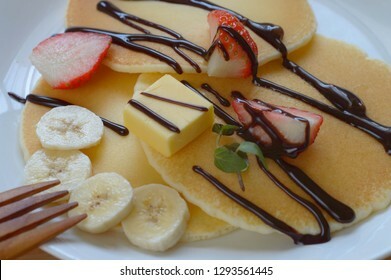 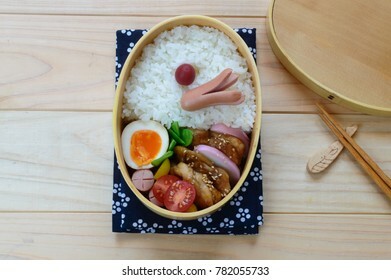 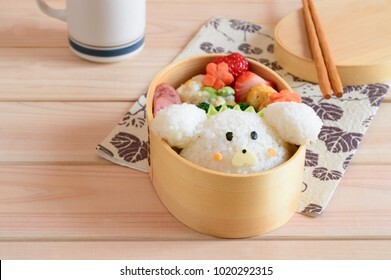 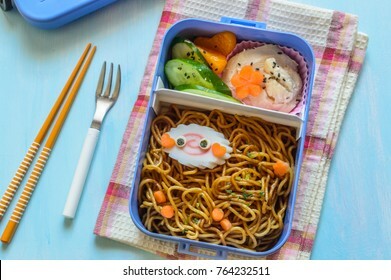 Kyaraben or charaben, a shortened form of character bento, is a style of elaborately arranged bento which features food decorated to look like people, animals, and plant. 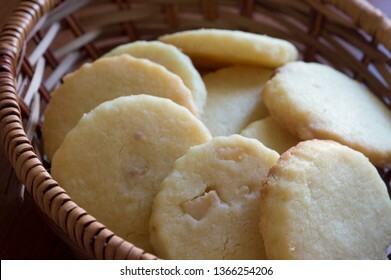 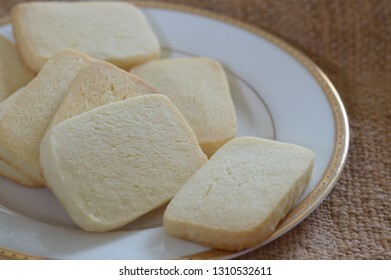 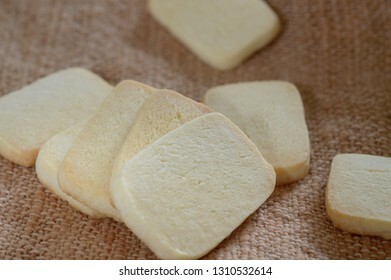 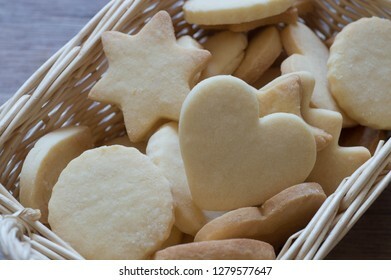 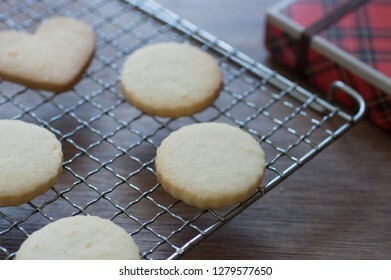 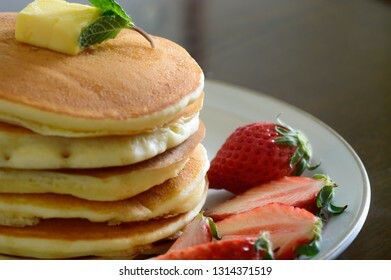 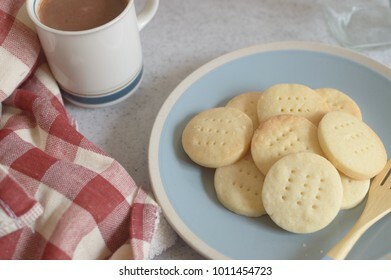 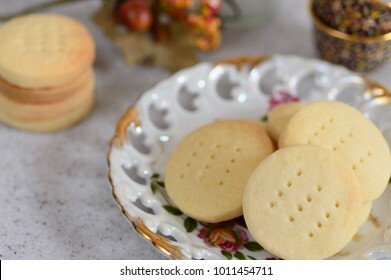 Butter cookies, known as Brysslkex, Sablés, and Danish biscuits, are unleavened cookies consisting of butter, flour, and sugar. 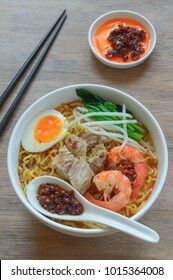 Hae mee (also called prawn mee) is a noodle soup dish popular in Malaysia and Singapore. 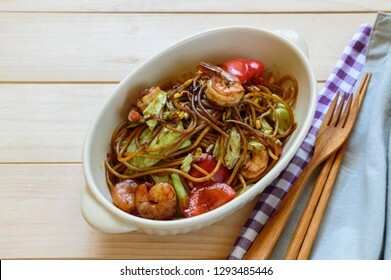 It can also refer to a fried noodle dish known as Hokkien mee. 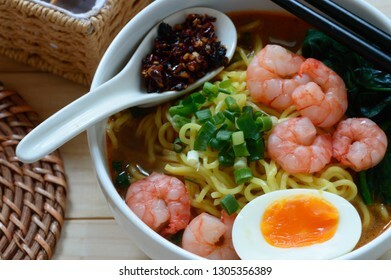 Its name literally means "prawn noodles". 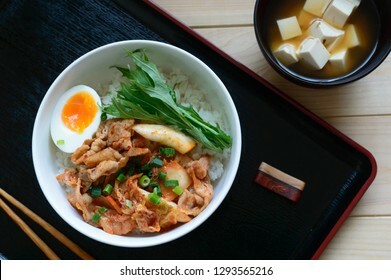 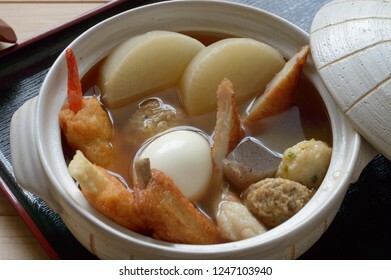 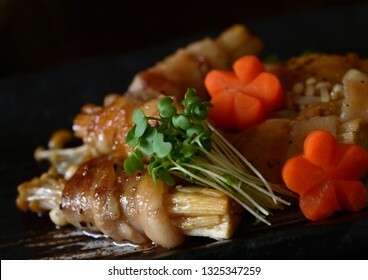 Oden is a Japanese one-pot dish consisting of several ingredients such as boiled eggs, daikon, konjac, and processed fishcakes stewed in a light broth. 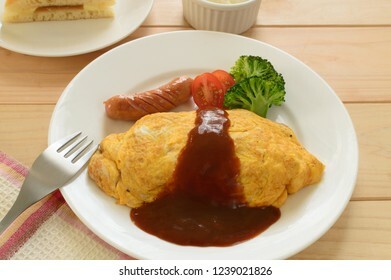 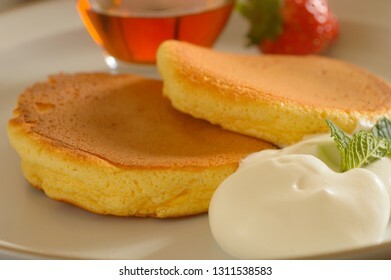 Omurice is an example of yōshoku consisting of an omelette made with fried rice and usually topped with ketchup or demi glace sauce. 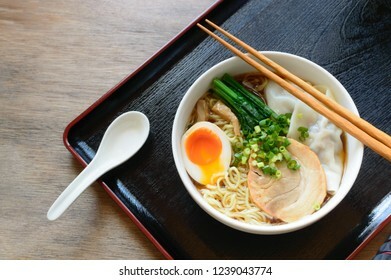 Nabeyaki ramen is thin, al dente noodles served in a chicken stock and soy sauce soup characterized by its light but powerful umami flavor. 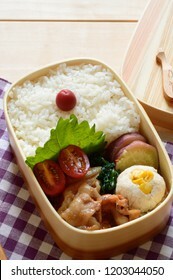 Toppings include chicken, shrimp and vegetables. 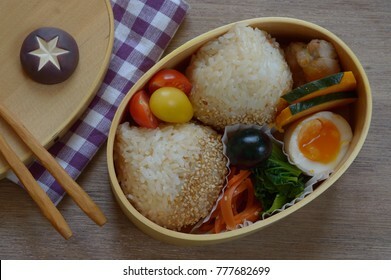 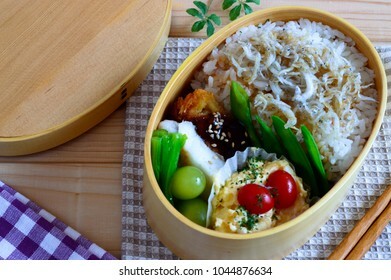 Bento is a take out or home-packed meal common in Japanese cuisine, A healthy version consists of rice, meat and the assortment of vegetables, It is an important food culture in Japan. 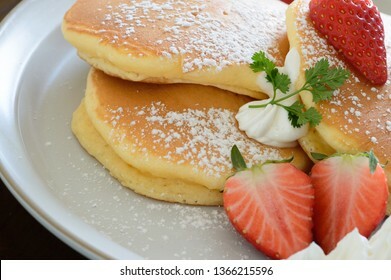 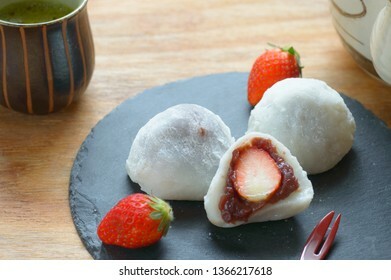 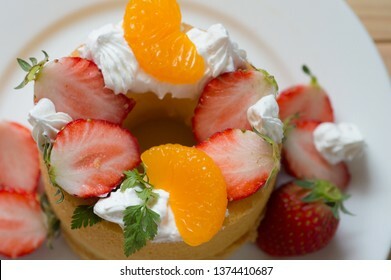 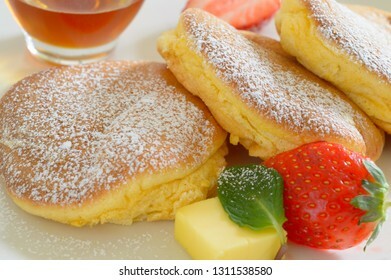 A popular spring dessert, Strawberry Mochi (Ichigo Daifuku) is a soft and chewy mochi stuffed with fresh juicy strawberry and sweet red bean paste. 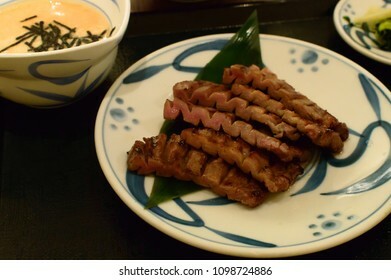 Hamburg steak is a patty of ground beef. 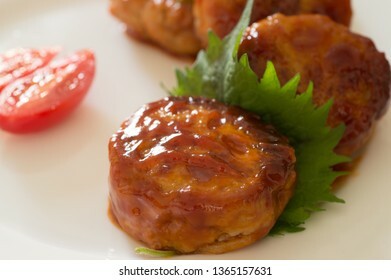 It is closely similar to the Salisbury steak. 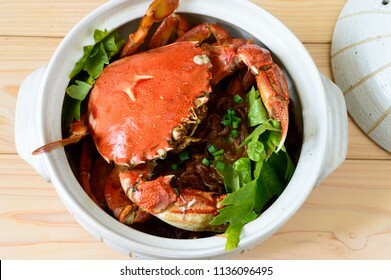 Made popular worldwide by migrating Germans, it became a mainstream dish around the start of the 19th century. 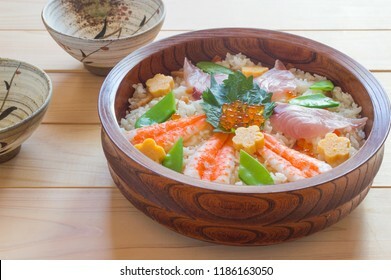 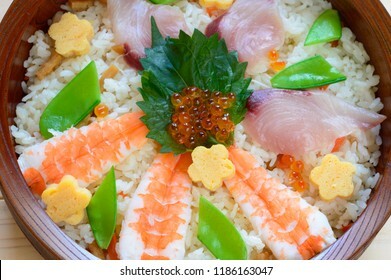 Chirashi sushi is a type of Japanese dish made with sushi rice topped with the assortment of sashimi and colorful garnishes. 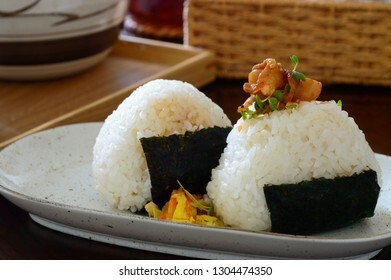 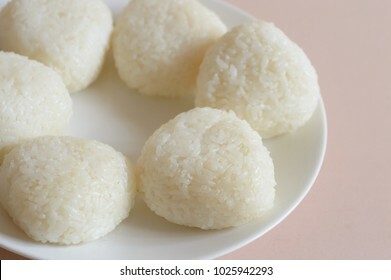 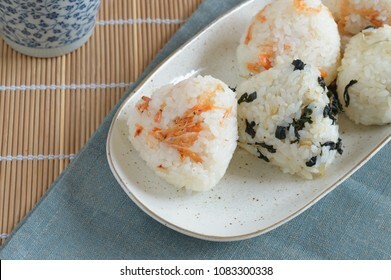 Onigiri, also known as omusubi, nigirimeshi or rice ball, is a Japanese food made from white rice formed into triangular or cylindrical shapes. 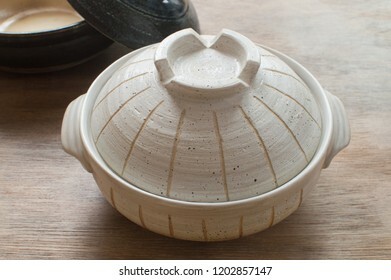 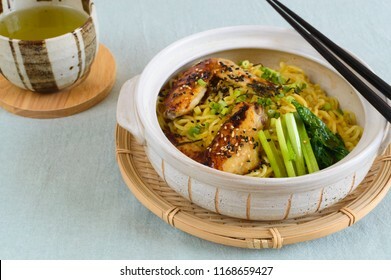 Braised noodles with teriyaki sauce topped with chicken wings cooked and served in a clay pot. 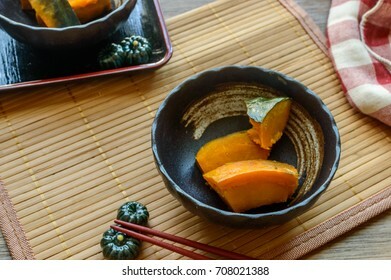 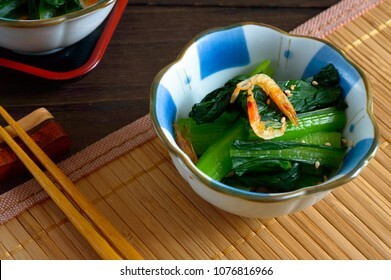 Bleached Japanese mustard spinach dressed in a savory noodle soup base sauce (Komatsuna Mentsuyuae) is a veggie side dish commonly served in Japan. 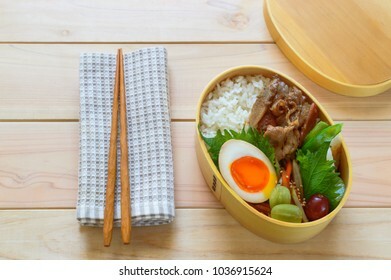 Bento is a Japanese takeaway lunch served in a box, often with the food arranged into an elaborate design. 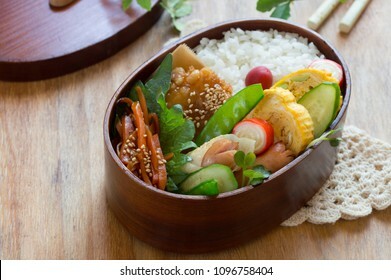 A traditional bento holds rice or noodles, fish or meat, with pickled and cooked vegetables. 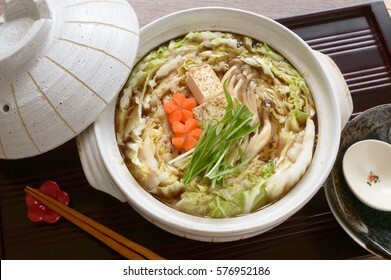 Chanko nabe is a Japanese stew commonly eaten in vast quantity by sumo wrestlers as part of a weight-gain diet. 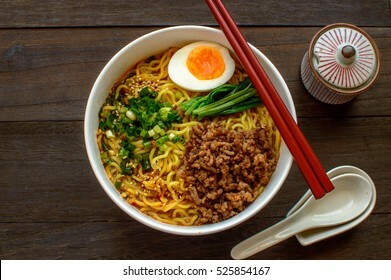 Tobanjan Ramen is a Japanese noodles dish inspired by Taiwanese cuisine. 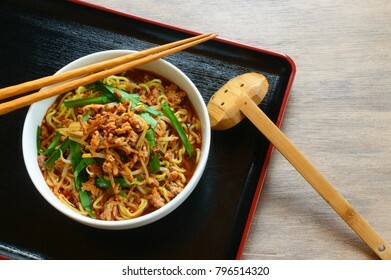 It consists of wheat noodles ladled with spicy soup and topped with ground pork. 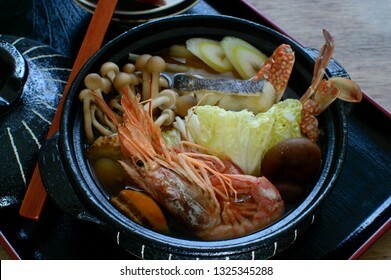 Nabemono, is a variety of Japanese hot pot dishes. 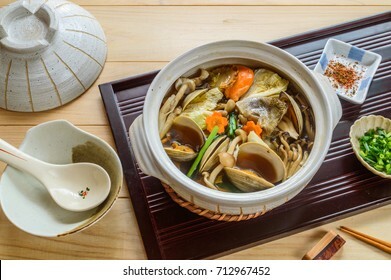 Most are stews and soups served during the colder seasons. 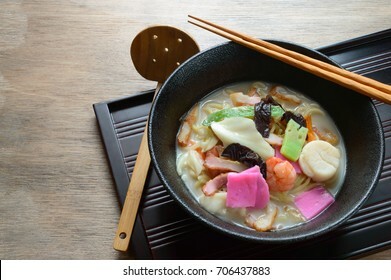 In modern Japan, nabemono are kept hot at the dining table by portable stoves. 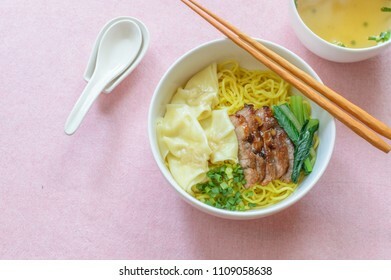 Wonton noodles is a Cantonese noodle dish which is popular in Guangzhou, Hong Kong, Malaysia, Singapore and Thailand. 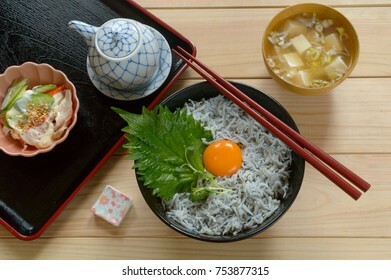 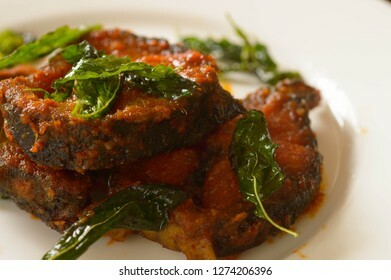 The dish is usually served in a hot broth, garnished with leafy vegetables. 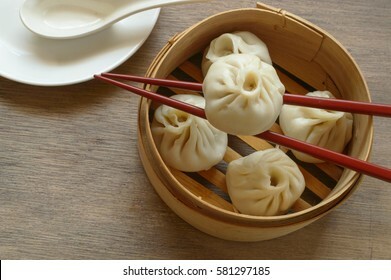 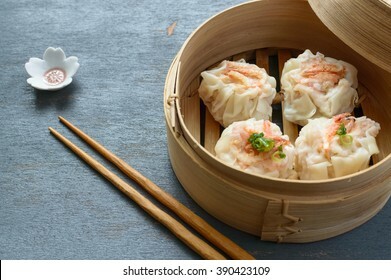 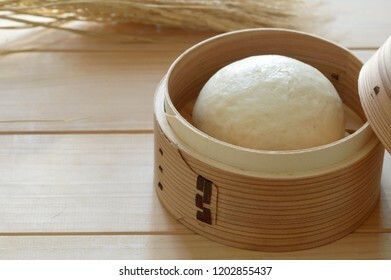 Baozi or bao is a type of filled bun or bread like made with yeast dumpling in various Chinese cuisine. 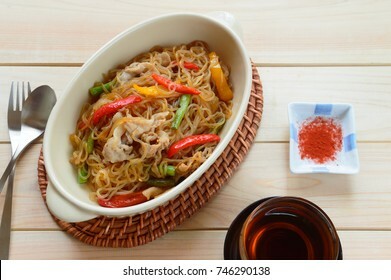 Dan dan, or tan tan noodles are a noodle dish originating from Chinese Sichuan cuisine. 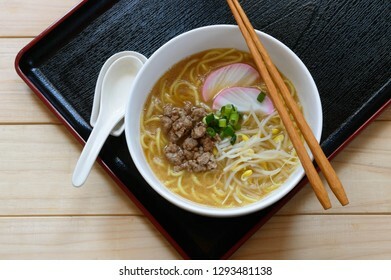 It consists of wheat noodles in spicy soup topped with seasoned ground pork. 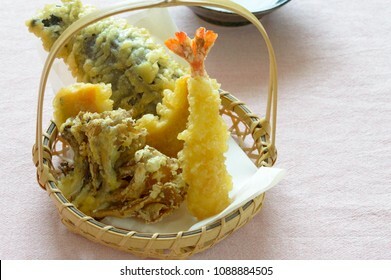 a basket of tempura. 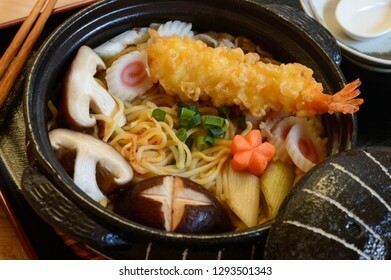 Tempura is Japanese dish usually consisting of seafood or vegetablthat have been battered and deep fried. 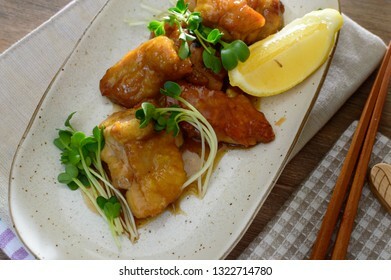 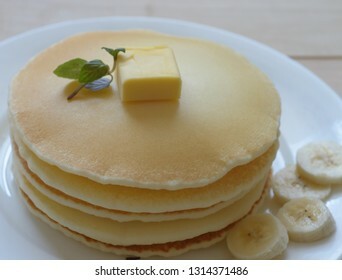 The dish was influenced by fritter-cooking techniques . 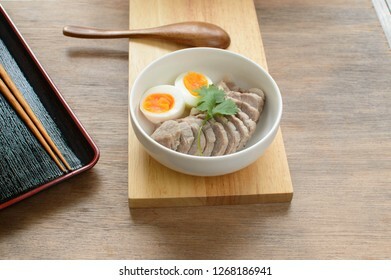 Nabeyaki ramen is boiled thin noodles served in a chicken stock and soy sauce soup characterized by its light but powerful umami flavor. 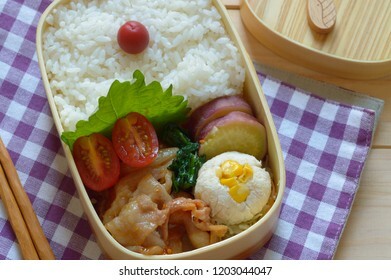 Toppings include chicken, shrimp and vegetables. 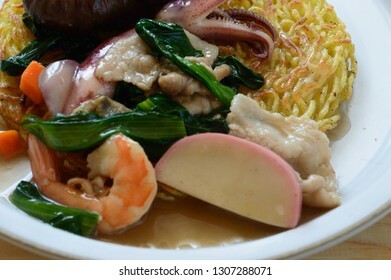 Hokkien Mee in Penang actually refers to prawn mee. 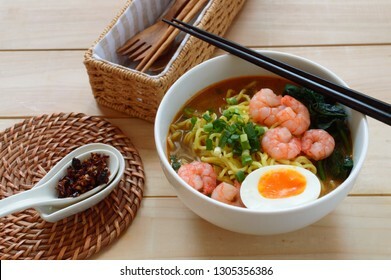 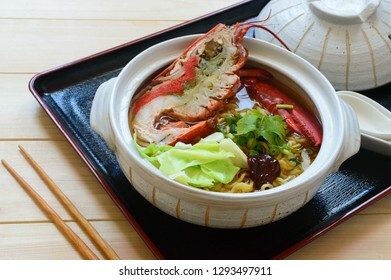 It is a pride of the Penangites, The dish consists of egg noodles ladled with pure shrimpy stock topped with boiled prawn, pork rib, boiled egg. 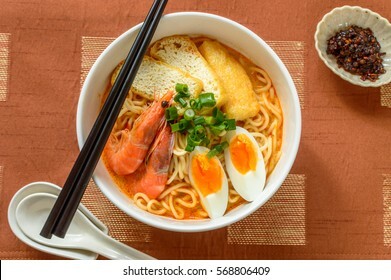 Laksa is a popular spicy dish in the Peranakan cuisine, which is a combination of Chinese and Malay cuisine. 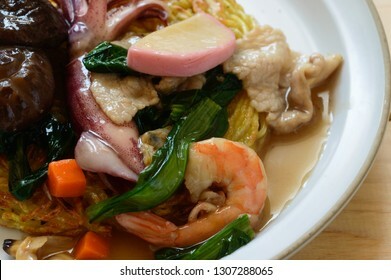 It consists of rice noodles or rice vermicelli with chicken, prawn or fish in spicy soup. 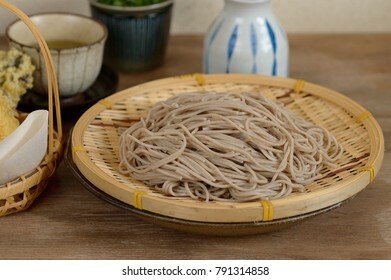 Soba is the Japanese name for buckwheat. 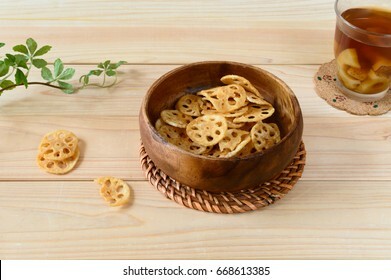 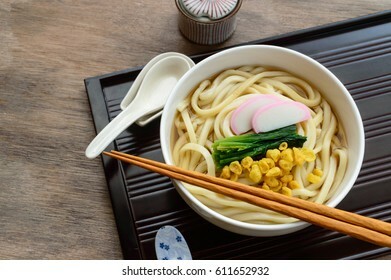 It usually refers to thin noodles made from buckwheat flour, or a combination of buckwheat and wheat flours. 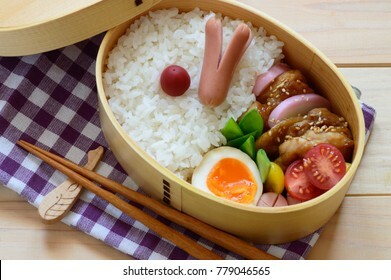 The cold ones are often served in a bamboo basket. 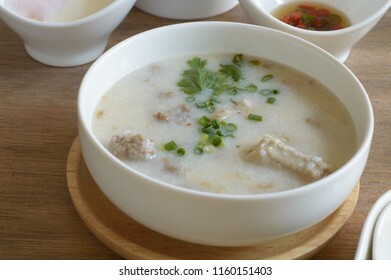 Congee or conjee s a type of rice porridge popular in many Asian countries. 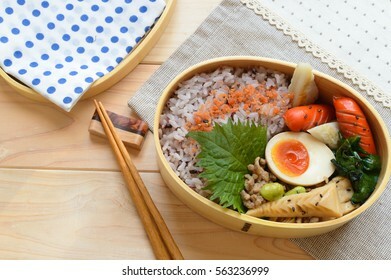 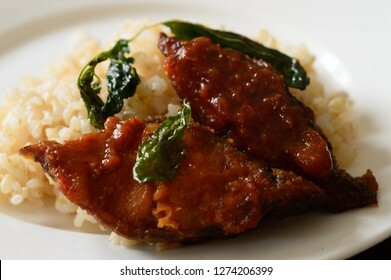 When eaten as plain rice , it is often served with side dishes. 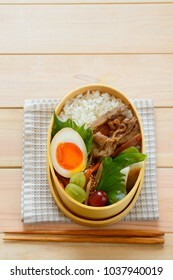 When additional ingredients such as meat, fish, are added. 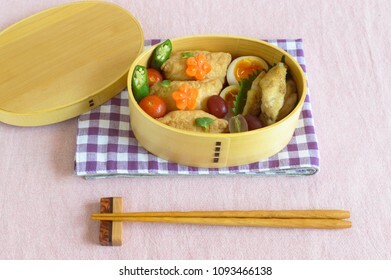 a delicious looking bento consist of inari sushi, grilled chicken wing and carrot. 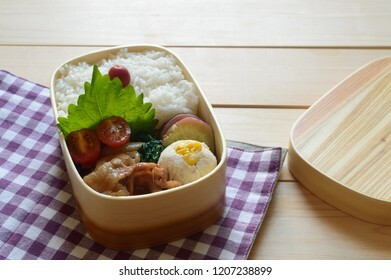 Bento is a single-portion take-out or home-packed meal common in Japanese cuisine. 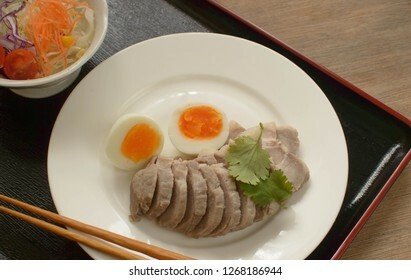 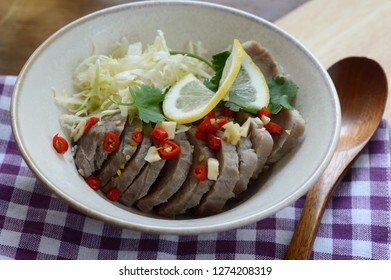 Shiobuta (salted pork) is a Japanese dish made with pork marinated with generous amount of salt. 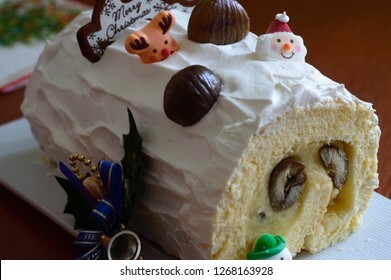 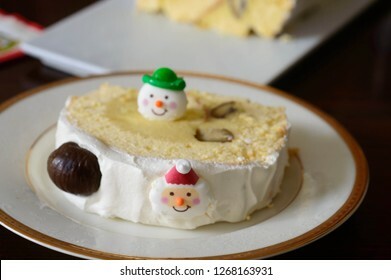 A Yule log is a traditional dessert served near Christmas, especially in Belgium, France, Switzerland, Quebec, Lebanon and several former French colonies, as well as the United Kingdom and Catalonia. 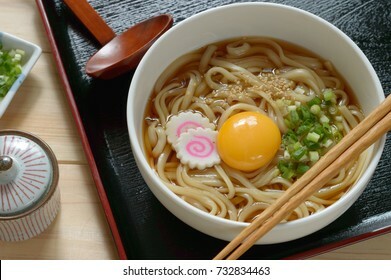 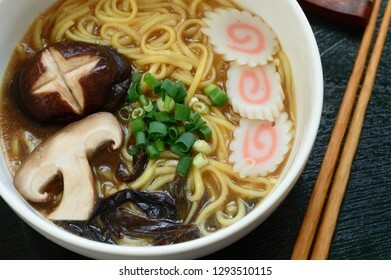 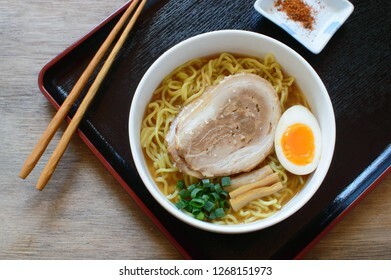 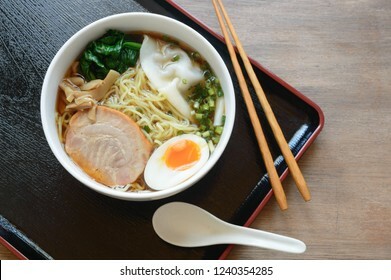 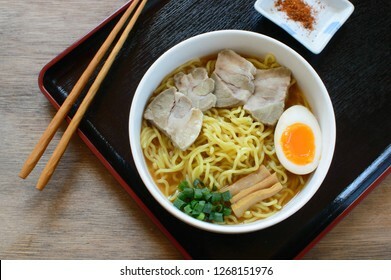 Miso ramen is a Japanese noodle soup with a broth seasoned with miso and served with a variety of vegetables and garnishes. 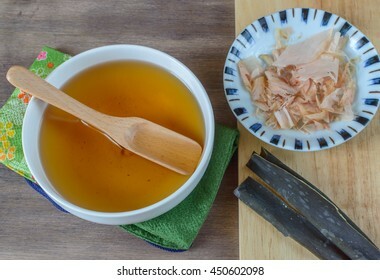 Dashi stock preparation. 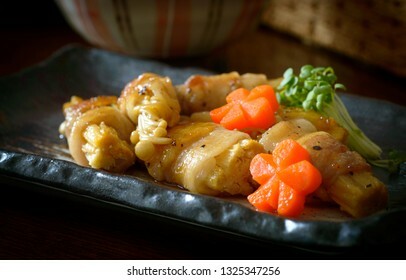 Dashi is a fundamental ingredient in many Japanese dishes. 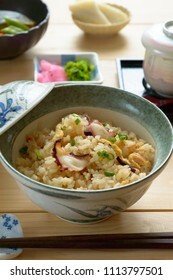 It is made from kombu , bonito flakes (dried smoked skipjack tuna, shaved into thin flakes) or anchovies/sardine. 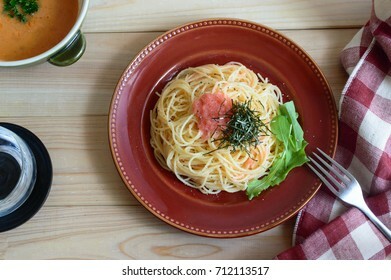 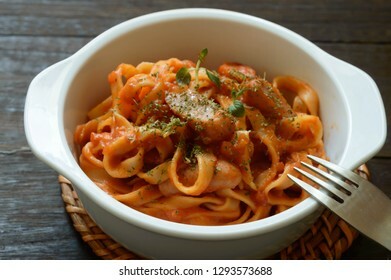 Tarako Spaghetti is a pasta dish made with cooked spaghetti and salted cod roes.